Rovio’s spinoff of the wildly successful Angry Birds series is available for download today for Android and iOS. Bad Piggies has already captured the top spot among paid apps and ranks second among top grossing apps in Apple’s store after less than 24 hours on the market. As the name suggests, gamers will be siding with the pigs this time around. Instead of trying to recapture eggs, players will control the pigs in an effort to collect even more eggs. Specifically, you’re trying to pilot the pigs from the starting point to the finish but it’ll take a bit of creativity and ingenuity to get the job done. Players are tasked with creating what Rovio describes as the ultimate flying / crawling / rolling / spinning / crashing device in order to complete each level. Game play is mildly reminiscent of what I remember from The Incredible Machine series from the mid '90s although the goal here is to build a vehicle rather than a Rube Goldberg type device to accomplish a simple task in a convoluted way. 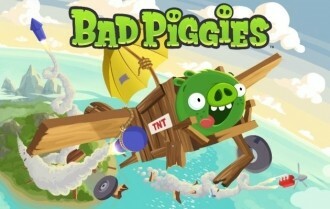 Bad Piggies has earned a 4.5-star rating on iOS and a 5-star rating from Android users. The game is available for $0.99 in the App Store for the non-HD edition while $2.99 gets you the full HD version on iPad. Android users can pick up copies on smartphones and tablets free of charge for a limited time courtesy of Google’s promotion to celebrate 25 billion app downloads.